Joseph Winsor was born in Yeovil in 1857, the son of leather glover George Winsor and his wife Sarah. Joseph was the fifth of six children and the 1861 census found the family living in Bond Street. The family were still in Bond Street in the 1871 census but by this time there were another three children. 14-year old Joseph listed his occupation as a baker. In the winter of 1878 Joseph married Ellen Ewens and altogether Joseph and Ellen were to have eight children; Frederick W (b 1881), Arthur G (b 1883), Ernest G (b 1885), Reginald Joseph (b 1889), Earle Samuel (b 1889), Stanley James (b 1891), Percy Lionel (b 1894) and another child who died in infancy. In the 1881 census they were living in Park Street with their two-month old son Frederick and Joseph's brother Albert. Joseph gave his occupation as a glove cutter, Ellen as a glover and Albert was a blacksmith. By 1891 Joseph and Ellen were living in Ebenezer Row, Middle Street (where Poundland is today) with five of their sons (Fred, Arthur, Ernest, Reginald and Earle) and a 14-year old servant girl. Joseph was still employed as a glove cutter. By 1901 the family had moved yet again and were living in Beer Street. By this time Fred had left home and Joseph and his two eldest sons, Arthur and Ernest, were all employed as glove cutters. 9-year old Stanley and 6-year old Percy were listed for the first time. In the 1911 census the family were listed at 63 Beer Street. By this time 54-year old Joseph and 51-year old Ellen had been married for 33 years. Living with them were the twins, Reginald and Earle, a bread baker and a pastry baker respectively, and Percy who worked as a tailor. By this time Joseph stated his occupation as 'Leather Glove Cutter (Foreman)'. Stanley, in the meantime, was living in Poole, Dorset, with the family of Herbert Berrill, a hairdresser and tobacconist. Stanley listed his occupation as a hairdresser's assistant. On 28 July 1914 the First World War started and four of Joseph and Ellen's sons were destined to fight in the war. Details of all the brothers' enlistments are unknown, but Percy enlisted in January 1916 and Stanley enlisted at about the same time. Men had a choice over the regiment they were assigned to and before the war would typically join the army for a period of 7 years full time service with the colours, to be followed by another 5 in the Army Reserve. However in August 1914 a new form of "short service" was introduced, under which a man could serve for "three years or the duration of the war, whichever the longer". Percy joined the 1st/5th Battalion, Hampshire Regiment and Stanley joined 12th Battalion, Somerset Light Infantry - both Territorial units. 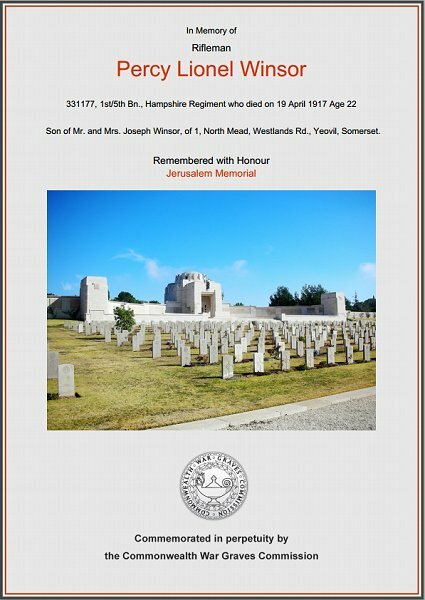 The records indicate that Joseph and Ellen's youngest son Percy joined 1st/5th Battalion, Hampshire Regiment in January 1916 as Rifleman, No 331177. This unit, a Territorial force, which was part of the Hampshire Brigade in the Wessex Division, was formed in Southampton in August 1914 and sailed on 9 October 1914 for India. Landing at Karachi on 11 November 1914, the battalion remained in India for the rest of the war. The 1st/5th Battalion, Hampshire Regiment, was formed in September 1914 as a home service, that is a 'second line' unit, which became part of the 2nd/1st Hampshire Brigade in 2nd Wessex Division. It too sailed to India in December 1914. Enlisting in March 1916, Percy would have sailed to India to join his unit, the 1st/5th. It is most likely however that he was later attached to the 2nd/5th Battalion which left India on 29 April 1917 and sailed for Egypt. The Battalion arrived at Ismailia, in north-eastern Egypt, on 5 April 1917 and was attached to 232nd Brigade in 75th Division. This 75th Division was created during the war. On 16 March 1917 the War Office gave permission to General Officer Commanding the Egyptian Expeditionary Force, Sir Edmund Allenby, permission to form a new Division from the units of the Territorial Force which were now arriving from India. On 21 May further instructions were given that the three infantry brigades should incorporate Indian battalions; this was augmented on 11 June by instructions that each brigade should have three Indian battalions and one British. It was, strictly, a Division of the Territorial Force but 'Indianised' to a great extent. At the outbreak of the First World War, Palestine (now Israel) was part of the Turkish Empire and it was not entered by Allied forces until December 1916. The advance to Jerusalem took a further year. No 331177, Rifleman Percy Lionel Winsor was killed on 19 April 1917, aged 22. On 18 May 1917 the Western Gazette reported "Mr and Mrs J Winsor, of Brunswick Street, have been informed that their youngest son, Percy, is missing after an engagement in the East on April 14th. He joined up fifteen months ago, and for 12 months had been in Egypt. He was 22 years of age and has three brothers in the Army." On 13 July 1917 the Western Gazette reported "Mr and Mrs Winsor, of Brunswick Street, have received official information that their son, Priv. Percy Winsor, is believed to have been killed. As reported in the “Western Gazette” a few weeks since, he was previously reported as missing. Priv. Winsor enlisted in January 1916, and after the usual training embarked for Egypt. Much sympathy is felt for the deceased’s relatives and friends." Percy Winsor is commemorated on Panels 28 and 29 of the Jerusalem Memorial in the Jerusalem War Cemetery. The Jerusalem Memorial commemorates 3,300 British and Commonwealth servicemen who died during the First World War in operations in Egypt or Palestine and who have no known grave. Percy Winsor's name is also on the Yeovil War Memorial in the Borough. The 75th Division later took the field in time for the Third Battle of Gaza and remained in action in Palestine, taking part in the Third Battle of Gaza (27 October-7 November 1917, including the Capture of Gaza on 6-7 November), the Capture of Junction Station (13-14 November 1917) and the Battle of Nabi Samweil (20-24 November 1917). The 2/5th Battalion, the Hampshire Regiment, was disbanded by 13 August 1918. The Commonwealth War Graves Commission certificate in memory of Percy Winsor. Stanley James Winsor joined the Somerset Light Infantry in early 1916 as Private, No 202195. He was later to serve in No 3 Company, 12th Battalion but it is most likely that he enlisted into either the 1st/5th Battalion or the 2nd/4th Battalion - both Territorial battalions of the Somerset Light Infantry - since these were the only Somerset Light Infantry units in Egypt prior to the formation of the 12th Battalion. The 12th (West Somerset Yeomanry) Battalion was a Territorial battalion of the Somerset Light Infantry formed at Ismailia in Egypt on 4 January 1917 from a dismounted yeomanry regiment. On 14 January 1917 the General Officer Commanding the Egyptian Expeditionary Force, Sir Edmund Allenby, gave orders for the reorganisation of the 2nd, 3rd and 4th Dismounted Brigades of Yeomanry - at the time all were serving on Suez Canal defences - and for their conversion and re-designation as the 229th (including the 12th Battalion, Somerset Light Infantry), 230th and 231st Infantry Brigades. These Brigades were organised as a Division, which began to assemble on 4 March 1917 near El Arish. It was, strictly, a Division of the Territorial Force. The Divisional artillery did not join until July, by which time the Division had already taken part in its first action, the Second Battle of Gaza. On 3 March 1918 the Division received a warning order to prepare to leave Palestine and move to France. It was relieved on 7-9 March and marched back to Lydda. Here the artillery was reorganised, a pioneer battalion joined and the machine gun battalion was formed. On 14 April Divisional HQ moved to Kantara, followed by the rest of the units. Embarkation began at Alexandria on 29 April. The first units landed at Marseilles on 7 May 1918 and entrained for the north. Concentration was completed in the area of Rue (near Abbeville) by 18 May. Training for unfamiliar operations, notably gas defence, was undertaken before toward the end of May when the units moved to the Doullens - St Pol area. On 14 July the Division took over a sector of front line near Merville and then remained in France and Flanders for the rest of the war, taking part in the Second Battle of the Somme, also known as the Second Battle of Bapaume, On 2-3 September 1918. Private Stanley James Winsor was killed on the first day of this action. He was aged 27. On 4 October 1918 the Western Gazette reported "Mr and Mrs J Winsor, of Homeleigh, Brunswick Street, have again been bereaved by the loss of a son who has fallen in the war. 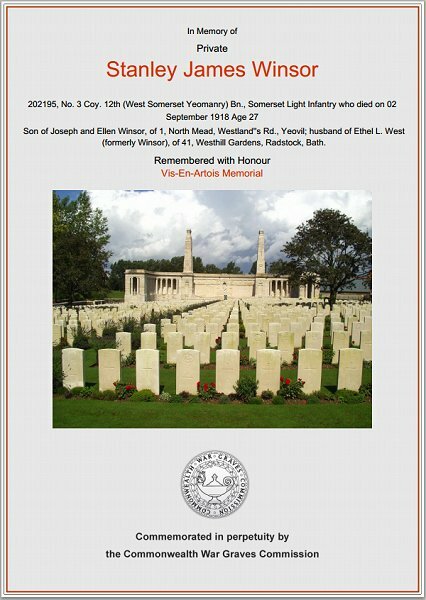 They received notice this week that their sixth son, Private Stanley J Winsor, of the Somerset L.I. was killed in action on September 2nd. Twenty seven years of age, Private Winsor had been in the Army about two and a half years. Before joining up he was employed by Mr H Hatt (the Mayor of Bath), having previously served an apprenticeship with Mr Membury, of Middle Street." Stanley Winsor is commemorated on the Vis-en-Artois Memorial in the Vis-en-Artois British Cemetery, Pas de Calais, France. The Memorial bears the names of over 9,000 men who fell in the period from 8 August 1918 to the date of the Armistice in the Advance to Victory in Picardy and Artois, between the Somme and Loos, and who have no known grave. They belonged to the forces of Great Britain and Ireland and South Africa. Stanley Winsor's name is also on the Yeovil War Memorial in the Borough, with his brother's. After his death, Stanley's unit took part in the Battles of the Hindenburg Line (the Battle of Epehy, 18 September 1918, and the Final Advance in Artois and Flanders. The Division crossed the Scheldt on 9 November and two days later the advanced units crossed the Dendre (Dender) Canal. When the Armistice came into effect they had occupied Ath. Five days later the Division moved to the area Rebaix - Herinnes - Tournai, and work was carried out on repairing the Tournai-Leuze railway. King George V visited the Division on 7 December 1918. Although demobilisation took place principally in the first months of 1919, Divisional HQ was kept in operation near Lessines until 10 July 1919. The Commonwealth War Graves Commission certificate in memory of Stanley Winsor.